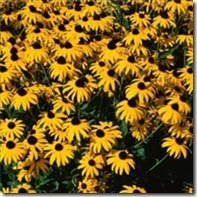 Black-eyed susans are also called rudbeckia, and they produce lush blooms of orange and yellow flowers. They are hardy perennial plants that provide the garden with vibrant flowers, and they are long-lasting cut flowers. They will self-seed and can become a pest if they are allowed to proliferate out of control. Understanding the planting conditions for black-eyed susans ensures healthy plants. Choose a location with full sun. According to Michigan State University, any type of soil is appropriate as long as the flowers have full sun. Wait for a time when the temperature is consistently above 70 degrees, as the seeds require between 5 to 10 days of temperatures between 70 and 75 degrees to germinate. Lay the seeds in the ground with about 15 inches between each seed. Loosely cover the seeds with soil. Do not hit the black-eyed susan seeds too strongly with a hose after planting, because this can wash the seeds away.